This painting by the self-taught Sichuan artist Peng Xiancheng illustrates a poem written in AD 753 by Du Fu, in which he criticises the extravagance of the Emperor's concubines' riding parties while the people suffered hardships. 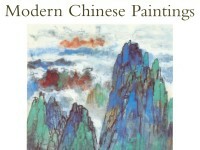 It is painted in the "boneless" style of Tang figure painting, comprising colour washes with little or no underlying linear structure. This painting by the self-taught Sichuan artist Peng Xiancheng (b. 1941) illustrates the poem The Beauties’ Spring Outing , written by Tang dynasty poet Du Fu (AD 712-770) in AD 753. At this time the emperor’s favourite consort Yang Guifei and her cousin Yang Guozhong were in power. 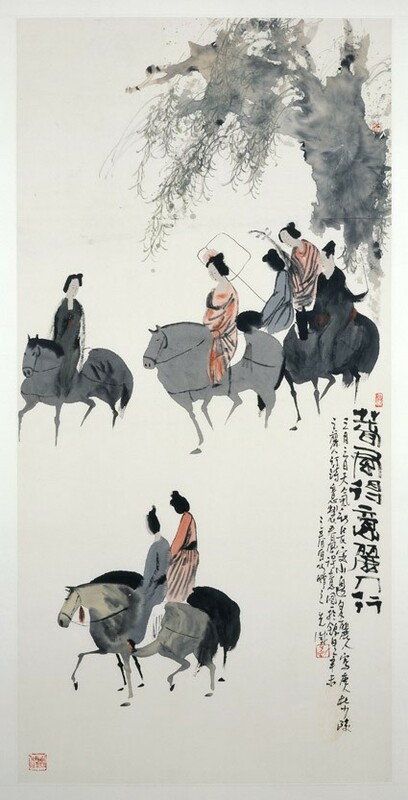 The poem criticises the extravagant riding parties thrown by Yang Guozhong’s two sisters whilst the people suffered hardships. The painting applies the ‘boneless’ style of Tang dynasty figure painting, comprising colour washes with little or no underlying linear structure.